There’s a new Murder on the Orient Express, of which you are no doubt aware due to Kenneth Branagh’s OTT mustachios invading your personal space. I’m not as bad as Trystan — I don’t HATE murder mysteries, I just can’t get into regular series. A one-off movie, like Death on the Nile (1978), And Then There Were None (2015), or The Witness for the Prosecution (2016)? Sure! So when my mom came to visit and wanted to see Murder on the Orient Express (2017), I was down. Now, I haven’t read the original Agatha Christie book or seen any of the previous adaptations, so in some ways it was good because I had zero ideas about the characters, plot, or who-did-it. On the other hand, I was less than riveted by the plot turns, and I’m not sure whether that’s due to Branagh’s adaptation or the story itself. I’m not going to give anything away in case you’re in the same boat I was in (knowing nothing), but once the truth came out, I just didn’t really believe that ALL of these characters were as motivated as they were supposed to be. Nonetheless, it was a perfectly entertaining movie, and the costumes were appropriate and lovely, so let’s take a look, shall we? They were designed by Alexandra Byrne (Persuasion, Elizabeth, Elizabeth: the Golden Age) and since this is such a high-profile movie, she’s done a ton of press. According to Byrne, part of the issue was that the movie was filmed on 70mm-wide high-resolution film, which meant that every detail could be seen on screen. 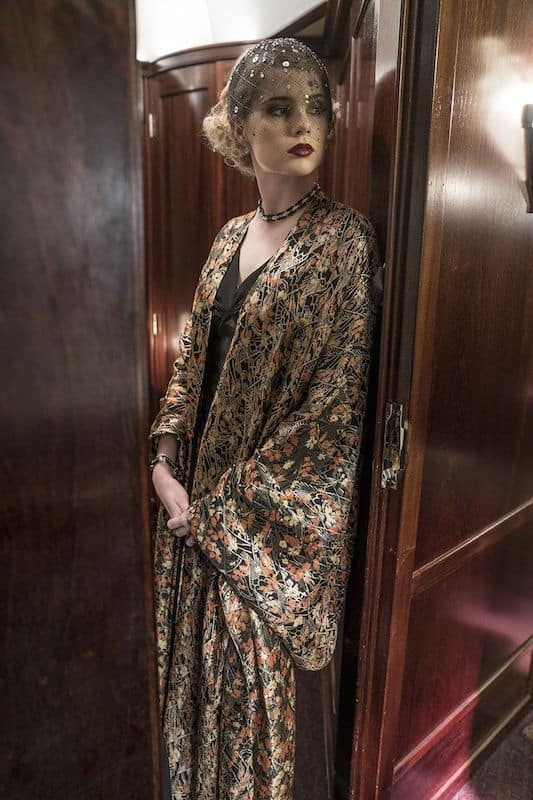 Thus, according to fashionista.com, “most of the pieces in the movie were custom-built by Byrne and her team to ensure impeccable condition and precise detail…” (How the ‘Murder on the Orient Express’ Costume Designer Outfitted Daisy Ridley and Michelle Pfeiffer in Authentic ’30s Clothing). 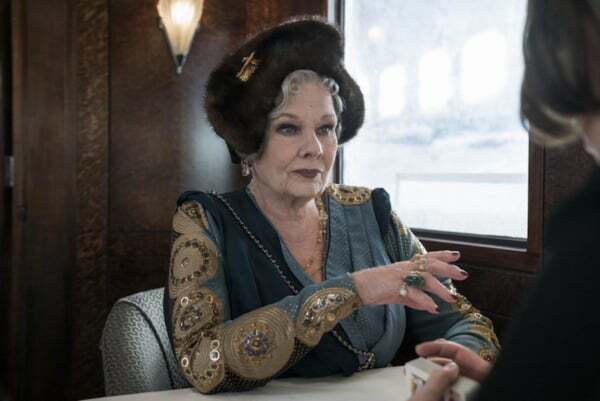 And, of course, Byrne says that she and the other filmmakers “wanted a total sense of period, but also a bit of modernity to the clothes” (Dressed to Kill: Inside the Lavish Costumes of Murder on the Orient Express). 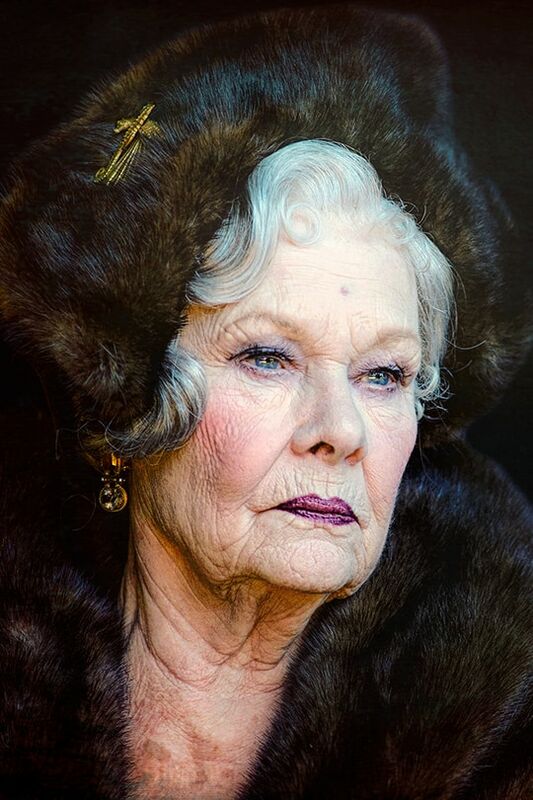 Judi Dench plays Princess Dragomiroff. Byrne says, “She is a wealthy Russian princess in exile who would visit the fashion houses, so I looked to Lanvin for influence” (How the ‘Orient Express’ Costume Designer Used Detective Clues to Style the Cast). 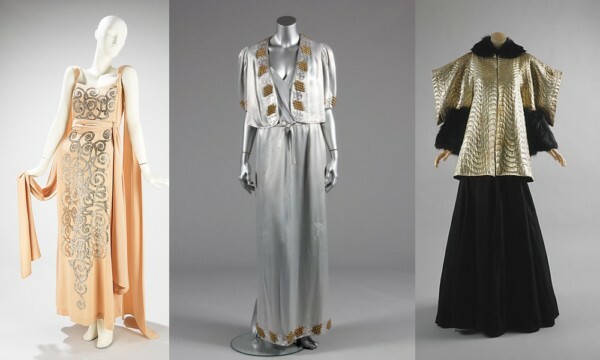 Various 1930s garments designed by Jeanne Lanvin. 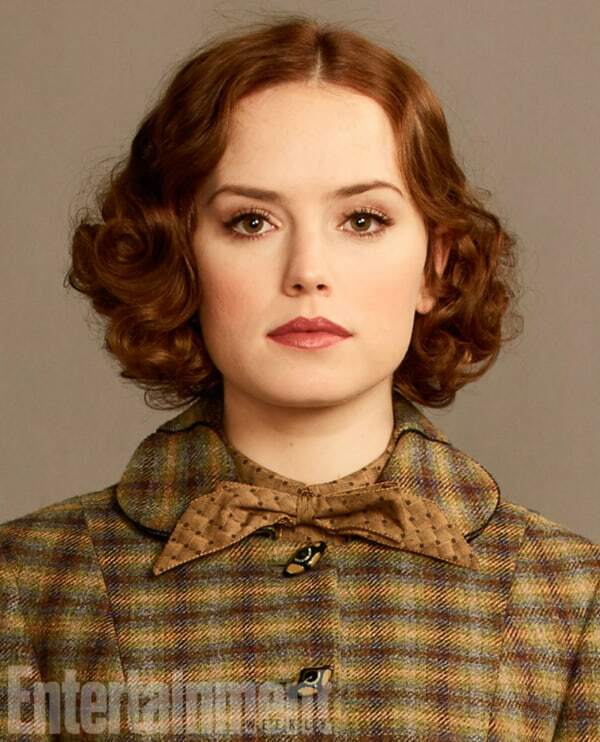 Daisy Ridley plays Mary Debeham, who is, according to Byrne, “a young single woman who needs to work to support herself… She wears sensible clothes, and has quite a small wardrobe” (How the ‘Orient Express’ Costume Designer Used Detective Clues to Style the Cast). And, of course, her costumes were my favorite — lots of nice tweedy and crepe numbers, lots of autumnal colors. 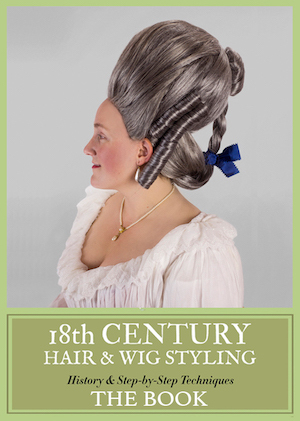 Lucy Boynton plays the reclusive Countess Elena Andrenyi, who is almost always hiding in her car and wearing lounging wear. Most of the fabrics were custom-made for the film, but according to fashionista.com, at least one of the Countess’ costumes was made from real antique 1930s lamé. 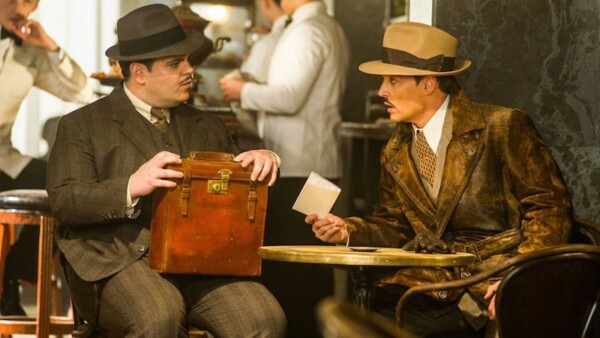 Johnny Depp plays shady American Edward Ratchett. According to fashionista.com’s interview with Byrne, part of the way they demonstrated his character was by putting him in loose and wide printed ties. And, of course, we gotta talk about that mustache, which was designed by hair designer Carol Hemming. Not being terribly attached to the character of Poirot, I thought it was OTT but I’m not terribly stressed about it … but I know many of you ARE stressed and feel like it’s too flouncy for the precise Poirot. 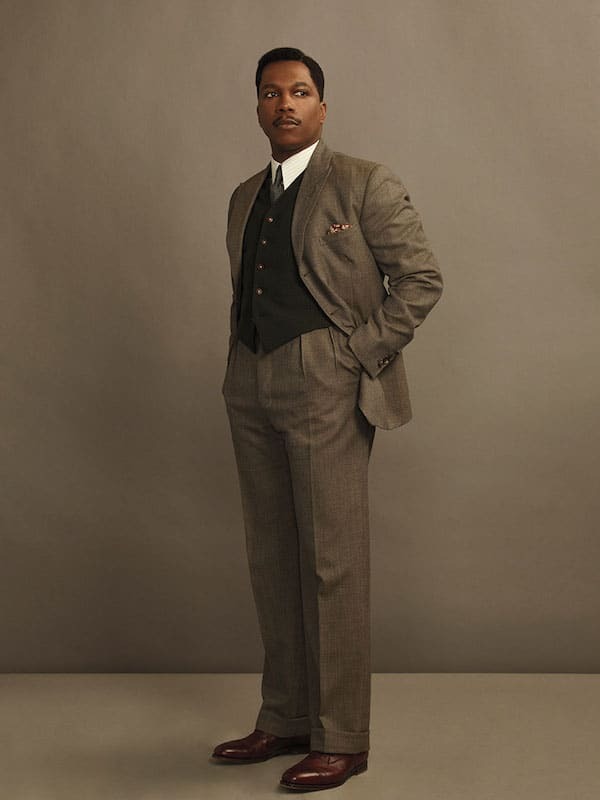 According to an interview with costume designer Byrne (so the quotes here are her’s): “Hair and makeup designer Carol Hemming devised a ‘double-mustache effect’ to achieve author Christie’s description of ‘one of the most magnificent in all of England'” (How the ‘Orient Express’ Costume Designer Used Detective Clues to Style the Cast). 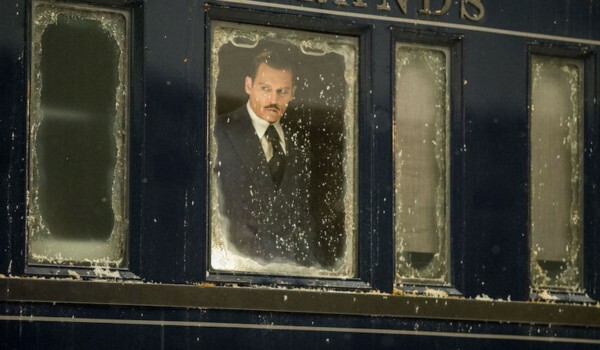 Have you seen the 2017 Murder on the Orient Express? 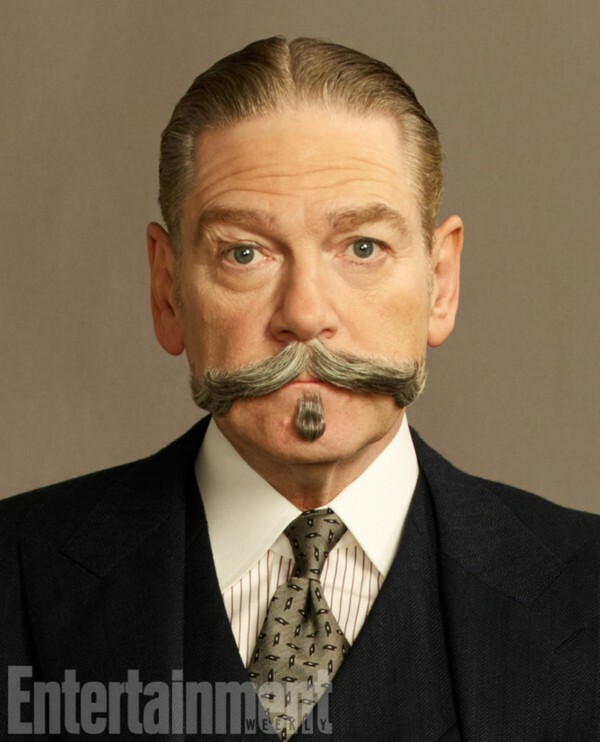 Feel free to rant about Branagh’s mustache in the comments! No but I’m going to. The costumes by Alexandra Byrne look amazeballs and I’d watch/listen to Dame Judi in anything. Nice to see that Daisy Ridley is in something other than a SW film. And Michelle Pfeiffer just is the icing on the cake. Sorry for me the only Poirot is David Suchet. Won’t be watching KB and that monstrosity on his lip. Though I have to say the costumes look very nice. Sorry, no. I can’t get behind that mustache. I do realise that David Suchet does not necessarily equal Poirot, but in Christie’s books there is enough mentions of the mustache being waxed and perfectly shaped. This brings to my mind a turn-of-the-century Russian official. Maybe Austrian. Not the fastidious post-WW1 Belgian detective. Show me on the David Suchet doll where the moustache touched you. The mustache is the right size, even if it could have been waxed a little bit more. Agatha Christie loved the 1974 movie, but one of her complaints was that Albert Finney’s mustache was too small for Poirot. She would have expressed the same complaint about Peter Ustinov and David Suchet’s moustaches. Ya I feel the same! I was taken aback at first cause I love Davis Suchet’s Poroit so much, but then I thought, no, Agatha Christie meant it to be big and beautiful! I went and saw the movie opening night and absolutely LOVED it!! I enjoyed the look of the movie. I was not as offended by Kenneth’s mustache as I thought I’d be, I thought he did a fine job with his overall interpretation (though David Suchet is Poirot to me forever). The treatment of the plot did not impress me, David Suchet’s Murder on the Orient Express episode was much better and made Poirot’s storyline make much more sense! I think by changing the mystery that happened immediately before he got on the train, his whole character drama and moral dilemma was completely lost. Removing Poirot’s Catholic faith and washing away the moments of Protestant/Catholic sparring between Poirot and the missionary woman passenger made the themes of mercy and judgement in this movie version anemic at best. I absolutely loved the mustache and felt it perfectly embodied the essence of the most particular and exacting M. Poirot. But then I’ve read all the books. The thing that creeped me out most about the stache is that half of it is actually cheek hair, shaved and styled so that the lip hair will blend into it. I don’t care for the ‘stache, but I could almost live with it if it weren’t for the soul patch. I feel there is something un-Belgian about that ‘stache. Probably the handlebar… And yes, I want to smack that soul patch with a rolled newspaper. Dame Dench is perfect, as always. I’ll wait till TV diffusion, though: Just like Joan Hickson was the ultimate Miss Marple, for me, David Suchet was the ultimate Poirot. What disturbs me is how old Ken is looking. He’s three years older than I am, and looks more than ten years older. Rode hard and put away wet? I will watch it (great cast!!) but… I’m sorry, that mustache is bloody awful. Bloody beautiful clothing..Didn’t look costume”y” if you like well- made garment,hair, styling..you will enjoy the movie. It adds not distracts. The treatment of the plot did not impress me, David Suchet’s Murder on the Orient Express episode was much better and made Poirot’s storyline make much more sense! I’m a fan of David Suchet as Hercule Poirot. But I’m not a fan of the 2010 adaptation of “Murder on the Orient Express” that he had starred in. Some aspects of it was pretty interesting and original. But overall, I didn’t like it very much . . . especially the adaptation’s last 20 minutes. My favorite version is still the 1974 adaptation, but I enjoyed this movie very much. I have seen all three versions, and read the book multiple times, and I still think the 1974 version is the best. The costumes and cinematography in the new version are great but I take serious issue with how they changed up the story so that Poriot just dominates everything. The story has been changed from a tightly plotted whodunit to the Branagh show — his scenery chewing was almost unbearable and they added a lot of unnecessary scenes which are just so, so, wrong. There are some great actors in this adaptation who are criminally underused, like Olivia Coleman. Yes, indeed in the Branagh show. 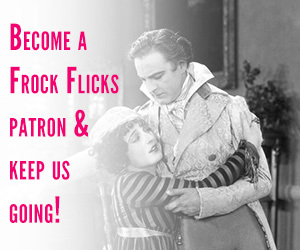 Ever since he did Frankenstein, when he went all shirtless & romance novel-cover, dumping Emma Thompson for HBC. He’s been smelling his own farts in a fancy goblet ever since. Before that, I really enjoyed him in Dead Again & Much Ado About Nothing, before he totally fell in love with himself. The story has been changed from a tightly plotted whodunit to the Branagh show — his scenery chewing was almost unbearable and they added a lot of unnecessary scenes which are just so, so, wrong. Interesting. I thought both Finney and Suchet did a lot more scenery chewing in their versions. By the way, none of the versions are an accurate adaptation of Christie’s novel. Perhaps it’s just as well. There are some aspects of the novel that I didn’t like. Especially that last chapter before Poirot revealed the “murderer”. Ugh I just roll my eyes at most of Kenneth Branagh in general. OF COURSE he would play Poirot with an absurd moustache, the man is all ego and self-aggrandizement. I also never want to see Johnny Depp on screen again after watching/fast-forwarding through the second Burton Alice in Wonderland. Whatever I thought of his acting before, I’m pretty sure was smoke and mirrors because that performance is terrible. 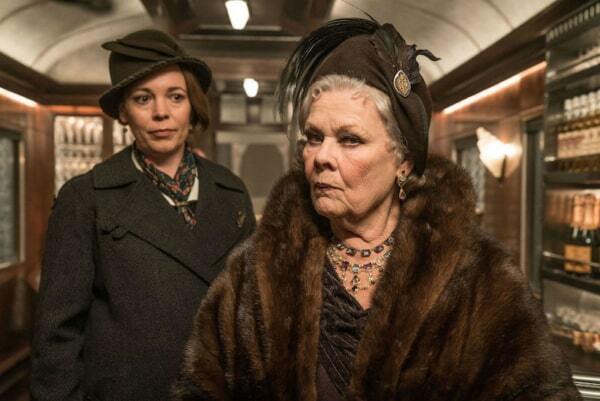 I like Daisy Ridley and Lucy Boynton, and Judy Dench is always fab, but have next to no interest in waiting out those two actors’ on-screen appearances. The costumes look nice, though. You make the costumes look so delicious, I may have to go see it. The mustache is rather horrifying, though. As for the plot, I always forget mystery plots, so it will be all new to me.